When it comes to food prep, some people get overwhelmed and don’t know where to begin. Not to mention we are BUSY and don’t have time to food prep. I prep twice a week because I just don’t have time to do all food prep in one day. Below are some of my favorite Quick Prep Recipes that I make regularly and I keep on hand most of the time in my fridge. I make a lot of it and freeze it or keep it in the fridge to snack on. 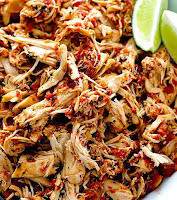 You can also find a lot of these recipes on www.Fitfluentialmom.com and clicking on Recipes in the black navigation bar. 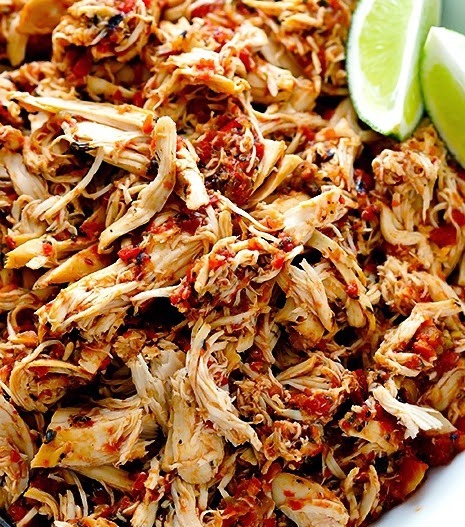 Place two chicken breasts in your slow cooker; completely cover with salsa. Season as desired with seasonings such as pepper, mustard powder, garlic powder, lightly with sea salt, onion powder, Mrs Dash, Flavor God, Costco No Salt Seasoning, etc. Just remember to take it easy on the sodium products and, if you can, avoid them. You’ll be MUCH happier with your results if you do and it’s only 5 days! Cook on low for 3-4 hours for thawed chicken or 5-6 hours for frozen chicken. 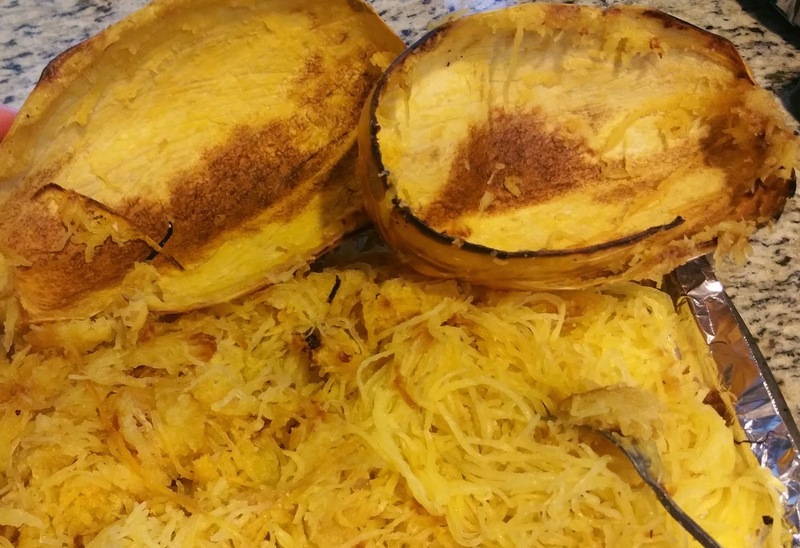 Once cooked, remove from heat and shred using two forks. 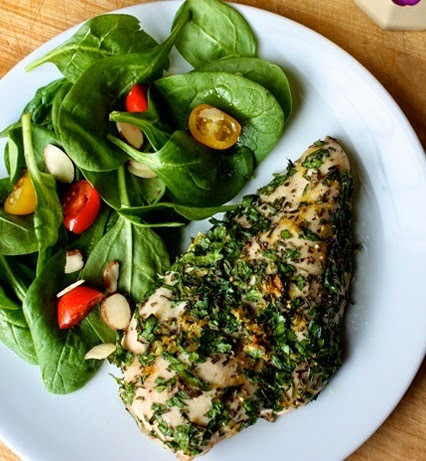 If you are cooking for your family too, increase the quantity of chicken breasts accordingly. You could also simply bake these in the oven, but they shred so much nicer and are so much jucier if you do it in the slow cooker. Marinate it in balsamic vinegar, lemon juice, cilantro and seasoning. Barbecue it or grill it in your oven for 30 minutes or so at 400 or until it’s well cooked. Marinate it in balsamic vinegar, lemon juice and seasoning. Barbecue it or grill it in your oven for 20 -25 minutes or so at 400 or until it’s well cooked. 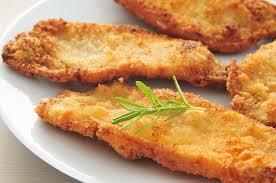 These are frozen uncooked all white meat chicken breasts breaded with crunchy panko breadcrumbs from Costco. They're delicious and super easy to make in a pinch! I buy the extra lean Jennie-O ground turkey and make it in a skillet. I just add some no salt seasoning and if they have the flavored variety (Italian, taco, etc), I buy that to make it faster. My family likes it on salads, in tacos, making it into turkey burger patties, as lettuce wraps or any other way you like to eat it. The only ways I really eat beef are in burgers (as lean as you can find them or make your own from lean ground beef) or in a lean steak. You can grill it or make it on the skillet. 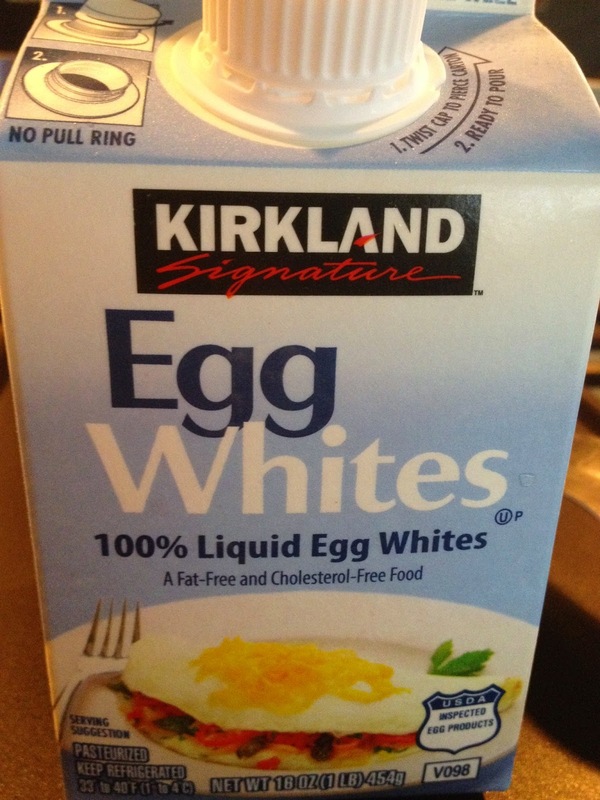 These are my favorite and they’re packed with protein. They come frozen so you just pop them in the oven for 20 minutes or so at 350 and they’re done. You can put a few in at a time and have them ready to go in the fridge. I prefer canned salmon vs tuna because it tastes better. I can literally open the can, squeeze some lemon juice in there, sprinkle it with no salt seasoning and eat it on top of a salad, bed of lettuce or just out of the can with a fork. I always have cartons of egg whites handy. Scrambled eggs with veggies you have on hand is a quick and easy low carb, high protein meal to make in a flash! BAKED: Place it in the microwave using the sensor cook setting or cook it for about 5 minutes. FRIES: Slice them up, spray or LIGHTLY drizzle with olive oil and spices and bake for about 30 minutes at 375. 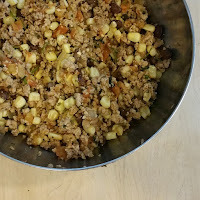 If you are cooking for your family too, increase the quantity of quinoa accordingly. 5. Store in two separate containers for easy access throughout the next week. If you are cooking for your family too, increase the quantity of eggs accordingly. These are the EASIEST veggies to make and have on hand. 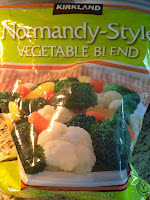 They come frozen and blended so you have a good variety (broccoli, cauliflower, carrots & squash), cleaned, chopped up and ready to steam and eat. Steam to desired tenderness, season with pepper and/or no salt seasoning and eat as a side dish, with cottage cheese, topped with parmesan, etc. Super easy to make and you can make it as a side dish or main dish. I have tons of recipes for it on my blog too! Cut it in half (this is the hardest part! ), take out the seeds, spray lightly with olive oil or lightly brush it on, put face down on a pan and bake at 375 for about 45 minutes to an hour. Then take a fork and scrape out the “spaghetti” from the inside. So delish and you can eat it like pasta with sauce and meatballs or as a side dish. My new FAVORITE type of squash. So delish and super easy to make. 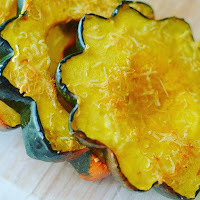 Just slice it up in ½ inch thick slices, remove the seeds inside and place on a non stick baking sheet. Spray lightly with olive oil spray or brush it on lightly, sprinkle some no salt seasoning, some parmesan and bake at 350 for about 15-20 minutes. Super easy and really good. Plus they look like little flowers so the kids like them too! 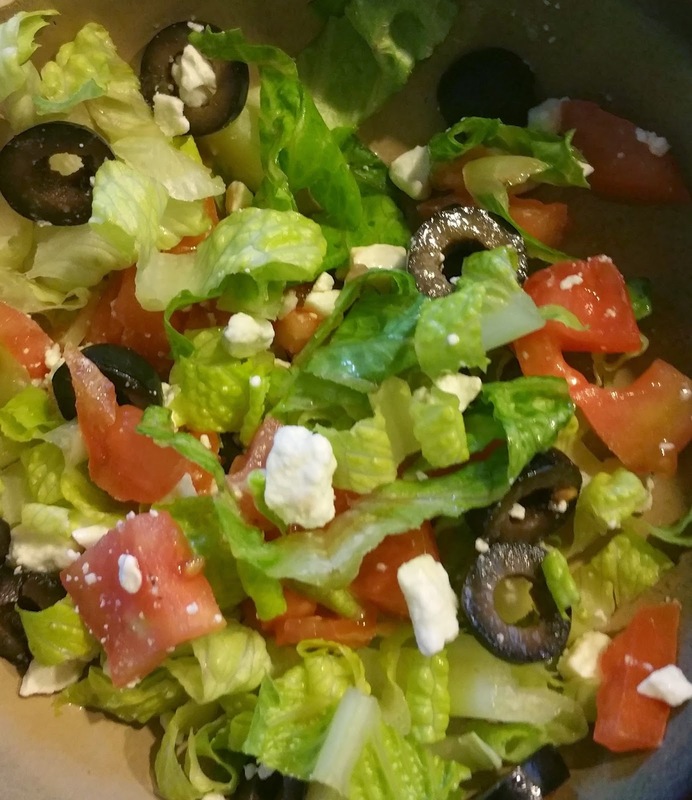 Romaine lettuce, chopped tomato, sliced olives, feta cheese & balsamic vinegar with a sprinkle of lemon juice. Easy and you can top it with chicken or eat it by itself! ******Many more recipes will be posted in the group over the next few days. These are just ideas of fast, easy foods to make if you’re hungry and you don’t have food ready to go.